This year's Nobel Prize announcement is around the corner and many science enthusiasts are speculating who may be the winners. Every year,　the Nobel Prize Committee faces the same problem: so many equally good candidates, and so few possible laureates. Choosing among them is not an easy task. To help the committee to make the right decision, I would like to humbly suggest a candidate, who, I believe, is an excellent fit for the 2015's Nobel Prize in Physics. Are you interested in who it may be? Keep reading! My candidate for this year Nobel Prize in Physics is Vera Rubin, an American Astronomer and a laureate of many prestigious prizes including the Gold Medal of the Royal Astronomical Society. Her main contribution to Astronomy and science in general is her finding that spiral galaxies, like our Milky Way, rotate in a very peculiar way. This finding not only changed our ideas about how galaxies behave, but also challenged our understanding of the whole Universe. It made scientists revise their ideas about what is actually "out there". What Vera Rubin found is that what we see in our telescopes may not be the whole story, that there may be more to the Universe than our eyes can see. Her observations suggest that the visible part of the Universe may be just a tiny fraction of what is actually there. That something is now commonly referred to as the dark matter for reasons I will explain later in this article. So what did Vera Rubin actually do? 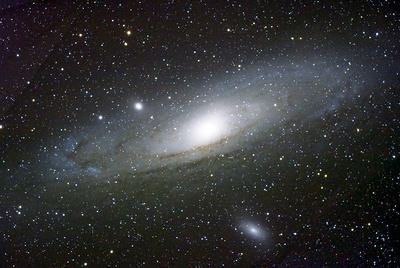 She, together with her colleague Kent Ford, measured velocities of stars in the neighboring Andromeda galaxy. ( See the appendix for the method they used.) By carefully analyzing the light coming from the stars and subtracting all known effects that may interfere with her measurements (like the redshift caused by the Universe's expansion), she found that the stars don't follow the rules astronomers believe they should. More concretely, she found that stars near the edge of the galaxy move with approximately the same speed irrespective of their distance from the galactic center. And that is really strange. So what rules are we talking about and what is so strange about Vera Rubin's data? As you most probably know, planets in our solar system orbit around the Sun. The Earth, for example, needs about 365 days to make one full circle. What you may not know is that as the planets get farther from the Sun, not only do their orbits get longer but their speeds get smaller as well. This is because the Sun's gravity gets weaker as the distance from the Sun gets bigger. (Mathematically speaking, the strength of gravity is inversely proportional to the square of the distance from its source). 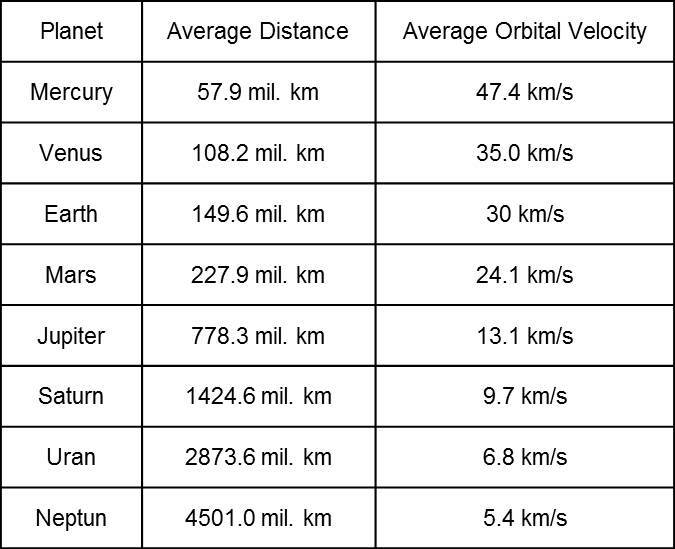 As a result, planets that are farther from the Sun need to slow down (relative to planets that are closer) to stay in their orbits. 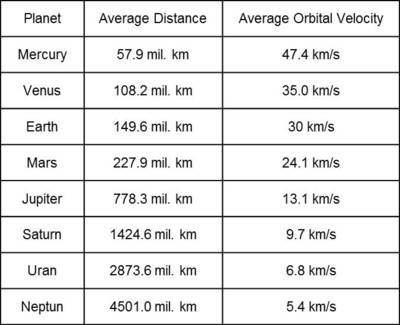 The table below shows the average orbit velocities of planets in the Solar system together with their average distances from the Sun. 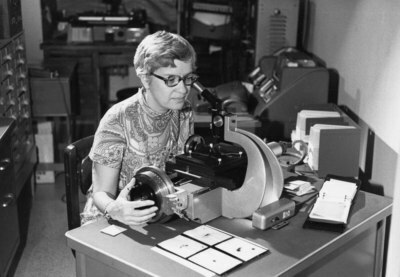 Now let's go back to Vera Rubin and her research. An important point is that similar to planets in the Solar system, stars in galaxies orbit, too. They orbit around the galactic center with speeds exceeding 200 km per second (about 3000 times faster than the Shinkansen, the Japanese bullet train). And assuming that the laws of physics are the same across the Universe, we would expect that the stars that are farther from the galaxy center should orbit slower than those closer to it. Right? However, that turned out not to be the case. As it was already mentioned, according to doctor Rubin's measurements (and she repeated her measurements for more than 60 galaxies with the same result), the speed of stars in galaxies does not depend on the distance from the galactic center. All the stars orbit with approximately the same speed regardless of their position in the galaxy, a big surprise indeed. Relation between the speed of rotation and distance from a center for a typical spiral galaxy. When first published, these results were met with fierce opposition. They didn't seem to make sense and they didn't fit into the picture people had about the Universe at that time. But the data spoke clearly. And as the evidence from other measurements done by other researchers accumulated, scientists had no other choice than accept that our understanding of the Universe is not complete. 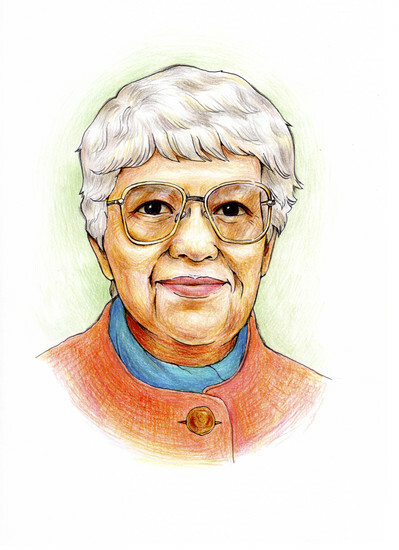 These days there are two popular classes of theories that are trying to explain the observations Vera Rubin and other scientists made. The First class, known as the modified gravity theories, suggests that it may be the case that the gravity behaves differently on different scales. What is true for the Solar system may not be true for an object like the Milky Way whose diameter is about 50 thousand times bigger, or for regions where the gravity is billion times weaker than on Earth. By modifying the law of gravity for such extreme cases, we may be able to explain our observations. However, to make the modifications justifiable, one has to offer additional reason for their existence (other than that for which they were introduced in the first place). But we are digressing here a little. The second class of theories is, I think, more popular. 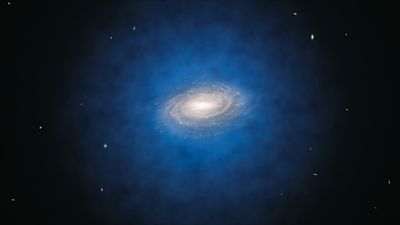 It suggests that in addition to the bright matter that we directly observe, galaxies also contain another type of matter, the so-called "dark matter". This matter does not shine at all (on any wavelength) and therefore cannot be seen in any telescope. Proponents of these theories believe that the gravitational pull of this additional matter, when properly distributed, can stabilizes the stars in their orbits and explain the observed data. The problem is that nobody really knows what this mysterious material is actually made up of. Scientists offer various suggestions ranging from black holes to exotic particles like axions or neutralinos (it's not a typo. Google it); but nobody knows for sure. What scientists do know, is that in order to explain the constant speed of the orbiting stars, the amount of dark matter in the galaxy must be at least 10 times the amount of the visible matter and has to be distributed in a way that it forms a kind of halo around the galaxy (see the picture below). If there was less material or the distribution of the material was different, the gravity would not be strong enough to hold the fast stars in their orbits. That`s interesting, isn`t it? Let me repeat it. We have no idea what dark matter is, nor if it exists at all. But what we do know is that if it does exist, it has to be distributed in a specific way and there has to be a huge amount of it. And all that we learned from observing the movement of stars in the visible part of the galaxy. So, it seems that Vera Rubin's findings may lead us either to an improved theory of gravity or to new findings in particle physics. Either way, there is no dispute that her observations will have a lasting impact on the way we think about the world. And that is, I think, worth the Nobel Prize. One method how to measure velocity of a distant object (a star for example) is to take advantage of a phenomenon known as the Doppler effect. 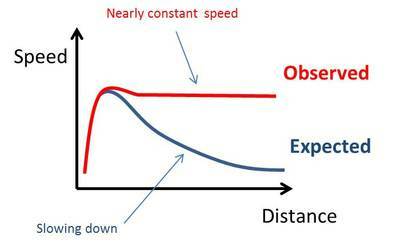 Doppler effect happens when a source of waves (any kind of waves - light, sound, water waves) moves relative to the observer. As the wave source moves towards the observer, the frequency the observer measures is higher than when the source is still. Similarly, when the wave source recedes, the measured frequency is lower. That is called the Doppler effect. If you have ever listened to an ambulance or a police car siren while they were passing you on the street, you know what Doppler effect is. As the car approaches, the pitch of the siren as it moves towards you is higher than if it were still. When the car passes, the pitch becomes lower. How much the sound changes depends on how fast and in what direction the car moves. The same is true for stars and their light. The light of stars is composed of many frequencies. The set of all frequencies radiated by a given star is called its spectrum. When a star moves, its spectrum changes (shifts) and the change depends on the star`s speed. The faster it moves, the more it changes. Since the relationship between spectrum and speed is known, you can calculate the speed of any observable star by just looking at the change in its spectrum. That's pretty clever, don`t you think? Spectrum of light radiated by an object moving away from an observer is shifted towards longer wavelengths (redshift). Picture source: Wiki Commons - Georg Wiora. Modified by Pavel Hejcik.